Whether it’s hot asphalt, pavement, inside a hot car or exercise exertion, it is extremely important to be aware of the conditions that could help prevent your pug from overheating. Air temperatures of 86 degrees can translate to asphalt temperatures of 135 degrees or more. At this point, you could imagine how this could affect the little precious one’s paws. More so, on a normal 70 degrees weather day, temperatures in a car, with windows up, can reach 40 degrees higher inside. 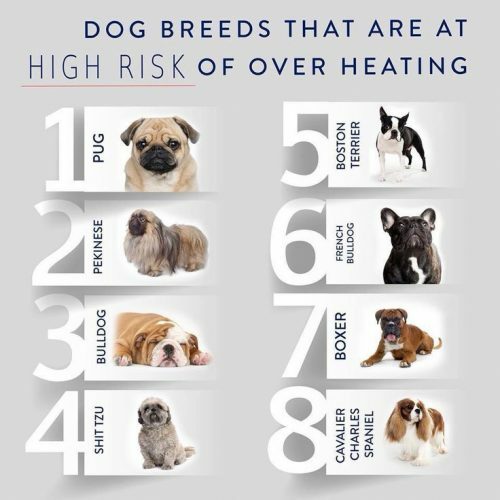 Coupled with breathing issues for this breed, these ideal hot conditions can prove to be deadly. 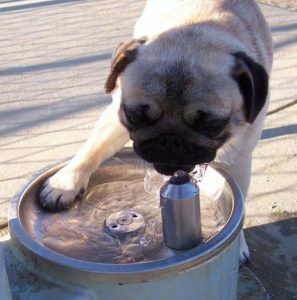 As a way to prevent the onset of difficulties, besides proper weight management, as a pet owner, it is imperative to be aware what conditions can help to prevent your pug from overheating. 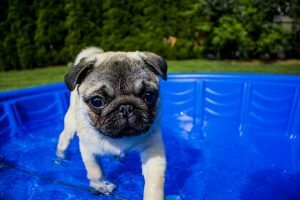 So how can you help prevent your pug from overheating? Consider getting a cooling mat for your Pug dog. Use of a cooling collar or a bandana around the dog’s neck as you walk them. Make some doggy popsicles from healthy ingredients so they can lick on. Allows ensuring their doggy water bowl is replenished. Try to avoid spending a long time outside during hot days. Early mornings or late evenings are best. Always run your A/C, in the car and the house, while investing in a few indoor fans. Get a baby play pool for the backyard or fill your tub slightly for some playtime fun. Ensure your Pug dog has been properly groomed if it has long hair. What Is An Ideal Weight For A Pug Dog? Your pet Pug can weigh slightly more than you usual and still be considered an ideal. A healthy weight can be determined by a number of different factors such as body structure and age. A Pug may be up to 21 lbs when fully grown and not considered to have a weight issue. On the other hand, if your Pug dog tops out at 22 lbs and more, this would be a situation where its weight would need to be addressed. 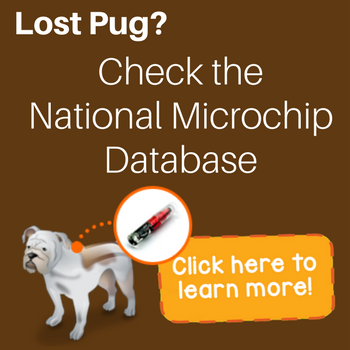 If you notice that your Pug is over expected weight in the second half of the first year of grown, even before he reaches his final sizing, this would also need to be addressed. Puppies should never be put on a diet. It is expected for them to have a round appearance and extra fat helps them maintain proper sugar levels and govern body temperature. There will be starts and stops, but generally, you want to see increased levels over that first year. 8-week old pups will be between 2 and 4 lbs and gaining a bit each day. By the 6 month mark, a Pug will be between 7 and 12 lbs. If a Pug is much heavier than this, he/ she should be checked by the veterinarian for possible weight issues. At only around 9 mths old, growth will slow down. A Pug will still gain a few more pounds over the course of the next 3 to 4 mths, but is very close to his/ her final weight. At about 1 yr, a Pug should be at his final adult weight, around, 1 or 2 lbs If a Pug continues to gain after this age, this could be a reason to be concerned in that he/ she is becoming overweight. A pug puppy should ingest fewer calories and workout to burn more. 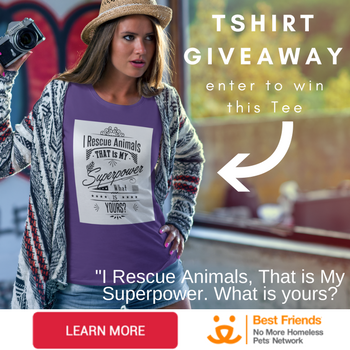 Since pugs have challenges with their breathing, exercise exertion can be very dangerous if encouraging the dog to run a mile or more with you. Not only can they have trouble inhaling during these activities, there is a possibility they can be prone to overheat. 1) Health check – Your Pug should have a complete medical examination to check for any weight related health the questions or other medical problems. Some issues such a high blood pressure may need to be controlled with the prescribed drug as part of a healthy is our intention to get your dog back on track. 2) Feeding – It is wise to lower the intake of meat related foods if you are currently feeding your pet as such. The ideal way to aid in weight reduction is to offer the same quantity of food while ensuring there are fewer calories being offered. At this point, it’s a great idea to start the introduction of vegetables and fruit to his/her main meals that will take the place of some higher calorie ingredients. Blending in some wholesome green beans and carrots to his/her kibble will allow him/her to eat a good quantity of meat while feeling healthier. 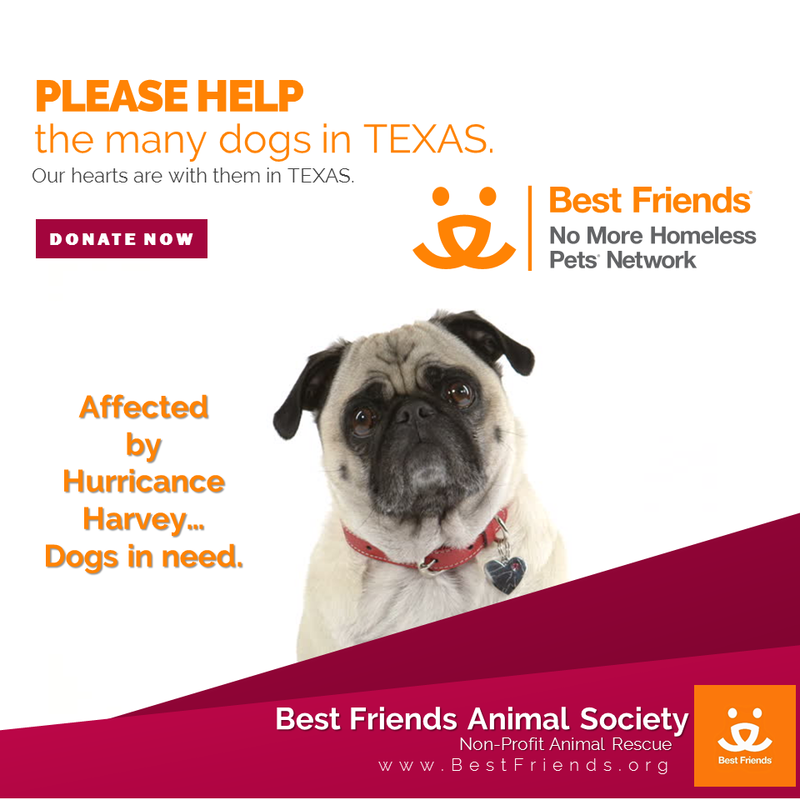 Remember that a good portion of your Pug’s intake is in the treats he/she is given. There are many healthy snacks for your Pug that can take the place of heavy calorie-laden treats. Don’t encourage your opportunistic pug to indulge. You may want to look into the option of cooking at home as it allows you to be completely in charge of ingredients and removes artificial coloring, preservatives, and by-products which are never healthy for a dog. 3) Activity –You’ll want to take a look at your dog’s regular exercise routine and begin by adding an extra 5 minutes to his/her daily stroll. Each week, this should be increased by five minutes until his normal walk-to day each day is doubled. For example, if you normally took your Pug for one 20 -minute stroll, the goals, and targets will be to add on 5 minutes per week for a final walking hour of 40 minutes per day. This can be split up into two 20 minute strolls or a 30-minute walk in the morning and a shorter 10-minute jaunt in the evening. Be sure to increase duration, not the speed. If a Pug, an especially an overweight one, is forced to exert himself too much, this can cause heavier breathing increased heart rate and strain on the body. Maintaining a temperature that is brisk for the Pug is all that is needed. Eventually, be sure to use a harness for your Pug to provide the tension of a collar on a leash which can be more constricting than ever.